Lingvo Live is a service for all who seriously study foreign languages. If you know a foreign language well, become an expert! 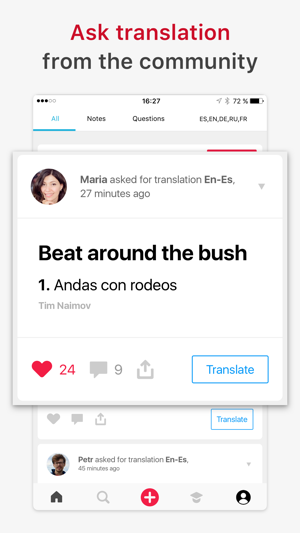 Share your knowledge with others, help with translations and earn your Translator's rating. Participate in exciting discussions about the languages and culture of different countries. Add words to our People’s Dictionary and chat with those who love languages just as much as you do! If you are a learner, become part of the community that shares your interest. Experts will help you in the stickiest of linguistic situations. 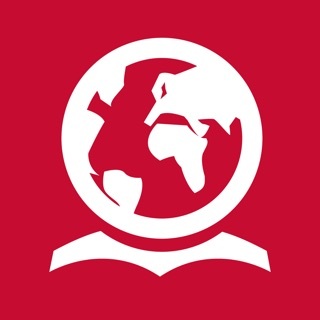 Ask, read posts about languages and cultures, and participate in discussions. 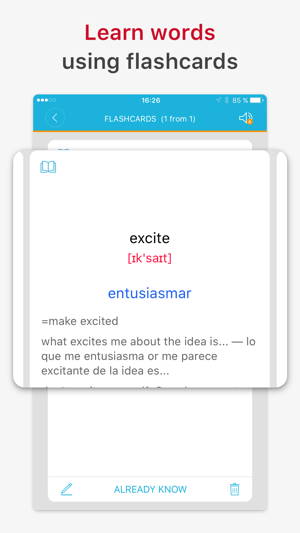 Use flashcards to practice words and phrases. Lingvo and Collins’ premium quality dictionaries will help both experts and learners in their linguistic endeavors. + Choose from more than 200 online dictionaries for 20 languages. + Listen to British and American audio pronunciation (online). 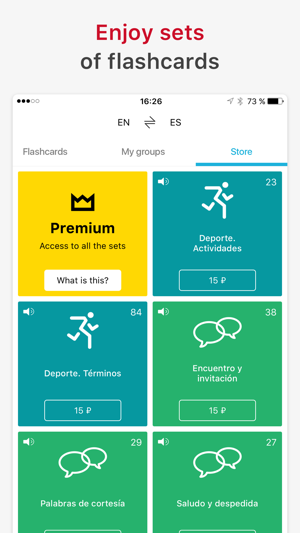 + Use flashcards to practice your vocabulary. + Look at examples and collocations. + PREMIUM: Get offline access to dictionaries. 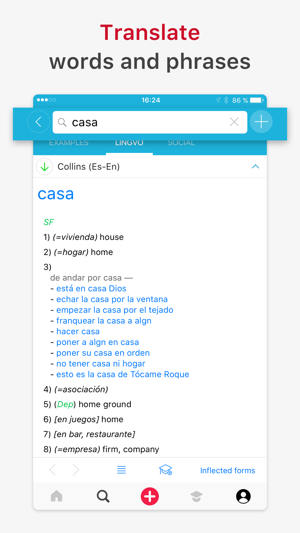 + Get free online access to Collins Cobuild Advanced Learner’s, Collins English-Spanish and Collins English-Portuguese​​ dictionaries. + Add translations to the People's Dictionary. + Ask for help with translation. + Read interesting articles about languages and culture of different countries. + Rate and comment other users’ translations. • thematic (food, sports, transport, religion, geography, etc.). All Lingvo Live dictionaries are licensed from leading international publishers. Premium Subscription provides access to more than 170 dictionaries for 17 languages OFFLINE. Please note: the subscription is automatically renewed at the end of the period unless you choose to cancel it at least 24 hours before the end of the current period. Payment will be charged to your iTunes Account after the purchase confirmation. You can manage your subscription and unsubscribe by accessing your Account Settings after purchase. You cannot cancel the current subscription during the active subscription period. If you have any questions or feedback, please email us at lingvo_support@abbyy.com and we will reply! Happy to inform you that we've updated our app! • support for iPhone X! 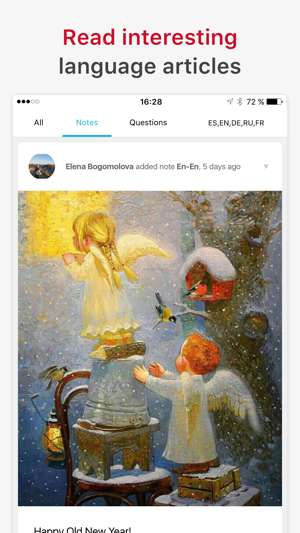 We hope that you like this update and you will find time to leave a review on our Lingvo App Store page. This is the best translator I have used so far, and believe me I have tried so many of those, but this stands out by everything!!! Recommend it to everybody!!!! I like flash card functionality. © 2019, ABBYY Production LLC. Полиглот 16 Дмитрия Петрова - Английский язык. Lite версия.